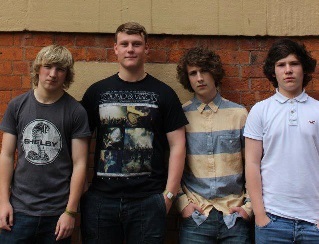 The Outreach Project A.K.A ‘TOP’ are an unsigned/non-managed upcoming Indie/Rock&Roll band aged 15&16 years old from Manchester, UK. We have James Ward-Mallinson as Frontman and on Rhythm Guitar, Kieran Abbey on Lead Guitar & Backing Vocals, Louie Donnelly on Bass & backing Vocals and Jack Scraggs On Drumkit & Backing Vocals. The Outreach Project formed in December 2011 purely for the love of music they shared and decided it would be a good idea to form. We would also like to change opinions of The few of the Older Generation of their prejudgemental theories/opinions they have that ‘All teenagers are on street corners causing trouble’, But we are not ‘One of them Teenagers’ and there are others that are just like who who have a passion and don’t get involved with those people who give us a bad name! We also raise money for Childern in Ethiopia, Africa who aren’t privellidged enough like ourselves to know right from wrong and we raise money for these children to give them a home, Schooling (with a good education), Food & Water, and also Vaccinations in order to help save their lives. We hold a 2 day festival in order to raise money for these unfortunate people and recently raised £1,500 for them over a 2 day festival and a fundraising gig. On the gig front, we have played/headlined a number of venues In Manchester, Oldham, London and Liverpool. for Example in Manchester we have played Manchester Club Academy (Twice) (Our First ever Gig, Supporting The Covelles), Dry Live, Moho/NQ Live, TV21, Heaton Moor suite, Alter Ego etc. We have Headlined at Nambucca in Islington, London. Also we have been main support at The Picket in Liverpool. EP RELEASED ON 15th FEBRUARY 2013! The EP is called The Outreach Project – On The Moors. Why did we choose the name ‘On The Moors’? : We decided to name our EP ‘On The Moors’ because we recorded it on the moors in Oldham, Saddleworth and when we are there at the studio we feel the best and we have so much fun up in the hills of the moors and have some good chill out times up there whilst we are recording, so it felt right really.